Walk into any tack store and you’ll find a myriad of horse rugs — from ripstop and waterproof, to wool and polar fleece. But, how do you choose the best rug for your horse, do you need more than one and should you rug your horse at all? In this article, we focus on rugging horses during the cooler months of Autumn and Winter. Horses possess a natural layer of insulation — a thick Winter coat — that shields them from the elements and protects them from the cold. Even at temperatures as low as zero degrees celsius, a thick Winter coat can help a fit and healthy horse withstand the cold without rugging. Young, growing horses, including foals, and senior horses are often more susceptible to cold conditions and typically require rugging to keep warm. However, regardless of age, any horse with low immune defences will also benefit from an additional layer of insulation in Autumn and Winter. To prevent a thick Winter coat for shows and competitive events, light rugging should commence from early Autumn and continue throughout Winter. But, be mindful of weather conditions and check on your horse regularly to ensure they are remaining comfortable in their rug. While horses can stay warm with a thick Winter coat at temperatures well below zero, wind chill and heavy rainfall may eventually penetrate. During these conditions, use a blanket with adequate insulation to trap heat and avoid lightweight blankets as they can have the opposite effect. 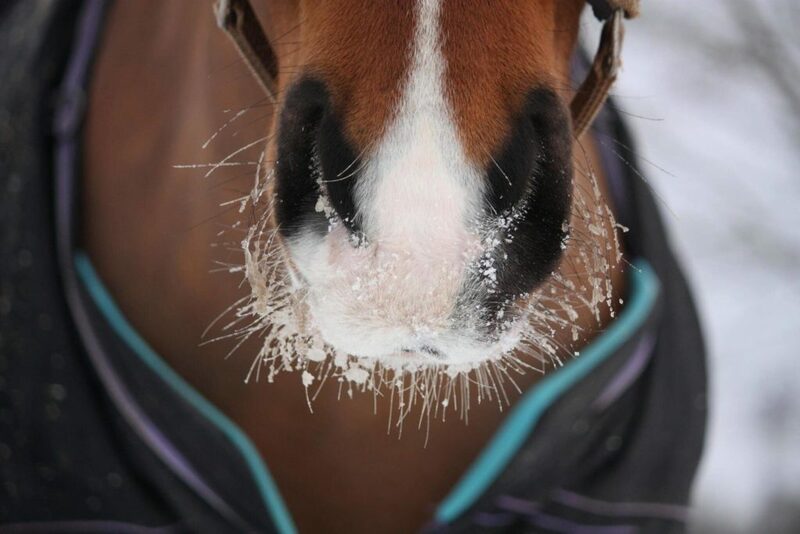 If your horse has recently re-located to a colder climate, they may require rugging for a period of 10-21 days. Shivering, a tense or stiff stance, cold ears, erect coat, turning their hindquarters to the wind and huddling with other horses are common signs your horse may be feeling the cold. A high fibre diet not only supports hindgut health, but promotes warmth during Winter. Horses may require more than 1.5-2.5% of their bodyweight in roughage per day. If hay and pasture sources are scarce, rugging is helpful, but shouldn’t be used to replace your horse’s diet. When getting started with rugs, a good rule of thumb is go lighter, than heavier. As humans, we often feel the temperature differently to our horses, and over-heating is a real danger when rugging. Starting with a lightweight Winter rug will allow you to learn your horse’s comfort signs. • A cold horse will likely be shivering under their rug. To determine if your horse needs a thicker Winter rug, or a second layer, feel your horse’s coat in numerous places under their rug. A cool coat or raised hairs often indicate a horse needs more insulation. • A warm horse will often begin to perspire under their rug, appear restless or become unusually thirsty. Again, feel your horse’s coat in numerous places under their rug, including the rib cage. If you suspect over-heating, remove the rug immediately or change to a lighter rug. • If any rain has penetrated under their rug and your horse appears cold, you may need to change to a better quality waterproof turnout rug. Where possible, avoid too many layers. More rugs means more chances of becoming tangled and leading to injury.